On March 16, the Town of Rosemère hosted Honored Citizens Evening to shine the spotlight on six special residents and one local organization. At this event, attended by roughly 100 people from the community, the awardees were presented with a certificate and an honorary pin and were asked to sign the Town’s Golden Book. This tradition, initiated in 2017, takes place every two years. This tradition, initiated in 2017, takes place every two years. This year, we have introduced the Yvan Deschênes Award, named in honor of one of our longest-serving mayors and a driving force behind the Town’s growth and development. 1. Hélène Bergevin for going the extra mile for a wide range of causes. 2. Eduardo Cary for his dedication and volunteer efforts in promoting local and regional soccer. 3. Roger Daigle for being a pillar of community life for more than 40 years, and still ready to lend a helping hand at nearly 82 years old. 4. Miori Hénault for outstanding athletic achievement leading up to her participation as a swimmer in the Parapan American Games in Lima in 2019. 5. 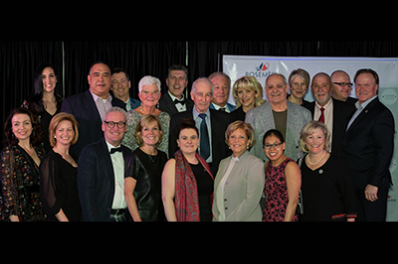 Jeunesse Action Rosemère for providing financial support to Rosemère youth to empower them to develop their athletic, community and cultural potential and help them flourish. 6. René Poirier for his passion for growing food organically and for sharing his love of gardening with young people. 7. Yvan Deschênes Award– Gayle Lemm for her tireless efforts to make life better for the less fortunate, both here at home and abroad. * Please note that tributes are published in the same language as they were read during the evening.